SM Energy has further increased its position in the over-pressured Frontier Sandstone oil play in the Powder River Basin. SM provided an update on existing well performance, which is very encouraging. The company’s position has the scale and quality to make material difference for the stock in the event of continued success. SM’s delineation program may provide a fresh impetus for other operators to accelerate their efforts. In the operating update that SM Energy (SM) discussed last week, the continued build-out of the company’s acreage position in the Powder River Basin (“PRB”) was perhaps the most notable development. This emerging play has gained critical mass in SM’s portfolio, and the company is ramping up its delineation effort. 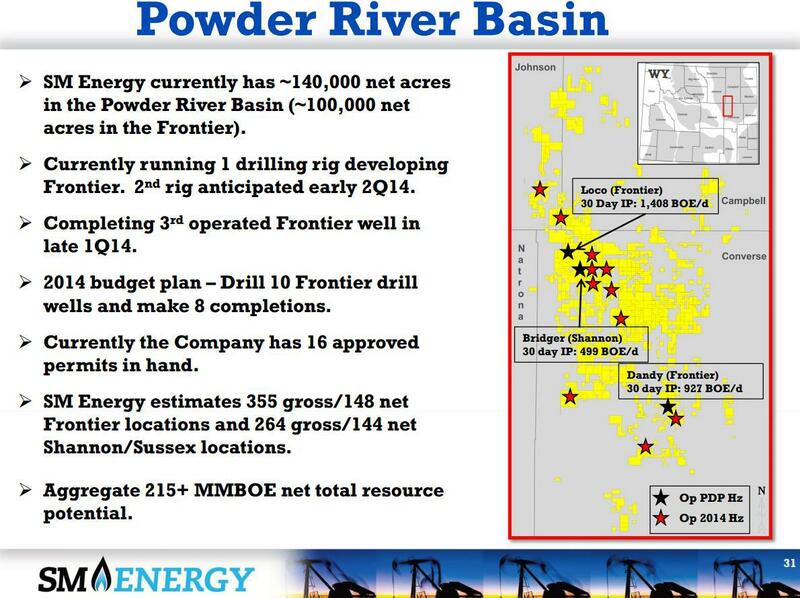 SM now controls ~122,000 net acres prospective for the Frontier (the operator’s primary target in the PRB’s stack of multiple oil-bearing formations). The acreage, which is blocked up and mostly operated, is located within what SM considers to be the most prospective over-pressured portion of the trend. 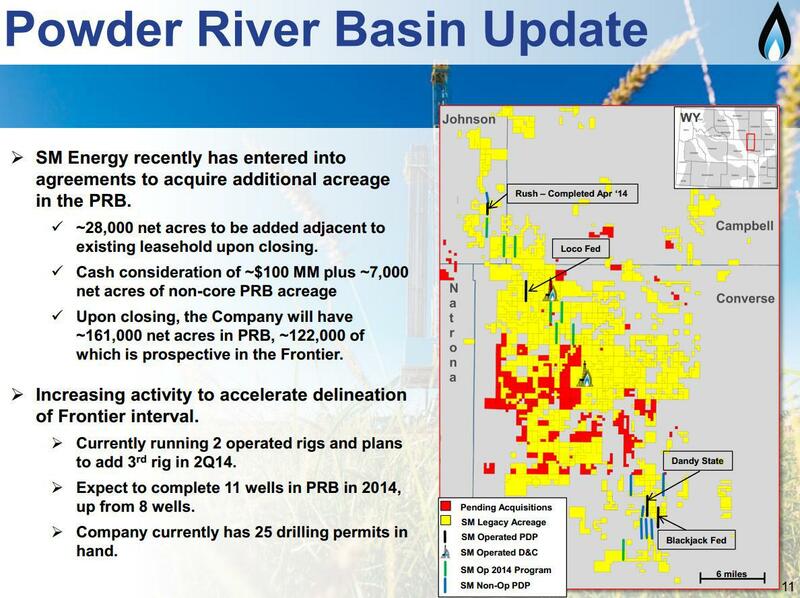 As a horizontal oil province, the PRB is not new. Operators have successfully produced from various sandstone formations in this basin, mostly from vertical wells. However, the greatest potential appears to be associated with a number of emerging horizontal oil plays. Two years ago, for example, PRB was heralded by Chesapeake Energy (CHK) as one of the most promising liquids-rich opportunities in its portfolio, mostly in connection with the Niobrara Shale play. Several other operators, such as Devon Energy (DVN) and EOG Resources (EOG), have also been working on cracking the code of this multi-stack resource. However, progress has been disappointingly slow. The acceleration of SM’s drilling effort in the Frontier and Shannon may help open a new chapter in the PRB’s development. From the SM stock’s perspective, the company’s leasehold in the area now has the scale and quality to “move the needle” and, in the event of success, could be very material to the company’s stock price. According to SM’s press release, the company has recently agreed to acquire approximately 21,000 acres (net of acreage trades) prospective for the Frontier, Niobrara, Shannon and Sussex formations for roughly $100 million in cash. The acquired acreage is located predominantly in Converse County of Wyoming, and enhances the company’s existing position. 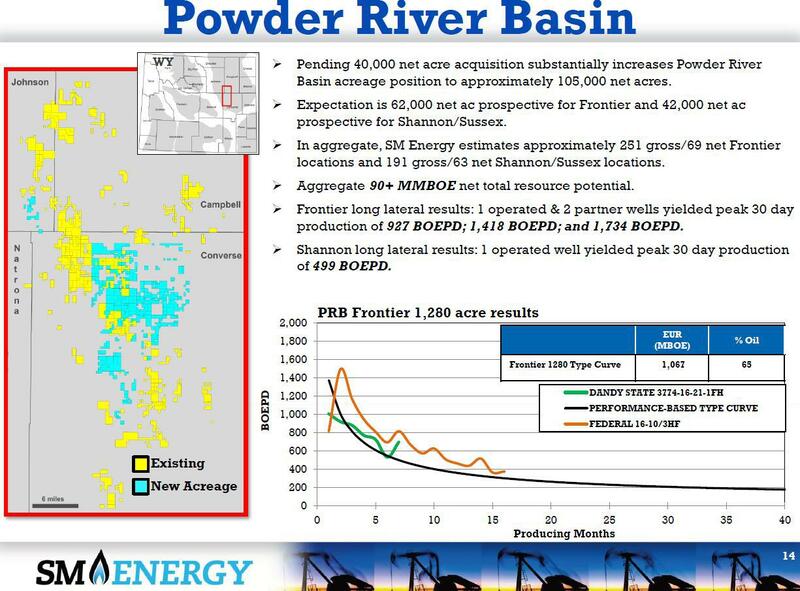 Once the transactions are completed, SM will have a total of 161,000 acres in the Powder River Basin, 122,000 of which will be prospective for the Frontier. A good portion of what SM is buying are additional interests in spacing units in which the company already has some interest. (“It’s a direct bolt-on to acreage we had, plus some nice fill-in around what we have.”) This will allow SM to operate more of its acreage and control the pace of development and capital deployment. After the closing, SM’s working interest in the acreage should increase to ~55%. As shown on the slide below, SM’s acreage in the PRB will extend over a trend area roughly 30 miles long, making SM one of the dominant lease owners in the Basin, alongside Devon and Chesapeake. This is not SM’s first significant acquisition in the PRB. A year ago, SM acquired approximately 40,000 net acres from QEP Resources (QEP) for $145 million, increasing SM’s previously disclosed position to approximately 105,000 net acres. SM planned to focus initially on the Frontier, Sussex and Shannon formations, and estimated combined resource potential on its acreage at 90+ MMboe. Since then, SM has been active in expanding its leasehold in the area, as is visible from a comparison of the map above to the year-old map below. The relatively high price that SM agreed to pay implies the company’s increased confidence in the play. Production history from existing wells is highly encouraging. The non-consent rate in new wells has declined, according to SM. The slide below shows the most recent cumulative production plots for SM’s long lateral operated wells in the Frontier formation, which is the primary target. SM commented that the wells are all performing better than the company’s threshold. SM’s most recent long lateral well, the Blackjack, had a 2-stream peak 30-day IP rate of 917 boe/d. SM is currently flowing back a 5,000-foot lateral well, which is “also looking good,” according to management, but doesn’t have enough producing days yet to calculate a 30-day rate. The first well, the Dandy State 3774-16-21-1FH, has been online for 15 months, producing over 250 Mboe. The well has tracked above the type curve. The two more recent wells, the Loco Fed 4076-9-4-1FH and Blackjack Fed 3774 27-22-1FH, are also performing at or above the type curve. The Loco Fed produced ~130 Mboe in about seven months. The decline rates exhibited by these wells are relatively low and give hope for high EURs. I must emphasize that the Frontier is a sandstone formation. SM indicated that its drilling results in the Frontier are already economic. For the long laterals, the company’s recent well cost has been about $16 million. However, SM thinks it can drill those wells for $14 million, assuming the same frac design that it currently uses (management noted that they may need to step up the frac size, which could drive the cost a little higher, but would potentially generate better wells as well). SM also estimates shorter lateral well costs in the $9-$11 million range. The cost for the most recent 5,000-foot lateral was about $11 million. SM estimates that Frontier wells, using the 850 Mboe EUR assumption and current $16 million well cost, exceed return hurdles (PV-15%/Investment of 1.2x, or ~25% rate of return). 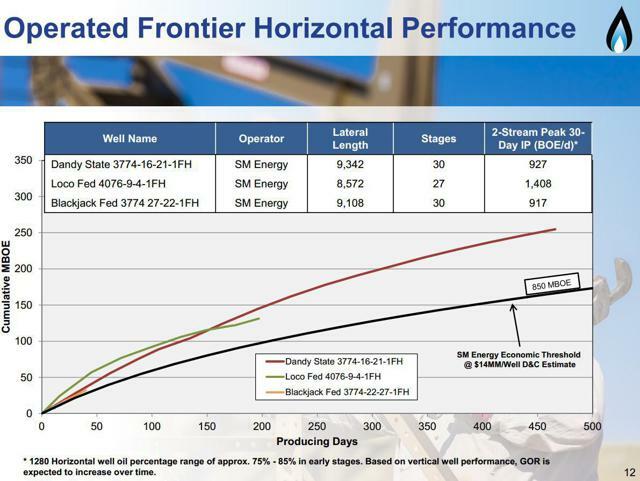 Using actual production trajectories, the wells are performing solidly above these hurdles. SM commented that it will continue to plot its well performance against the 850 Mboe EUR comparison benchmark – which may prove conservative – until it has enough wells to be able to present a reasonable type curve. The wells drilled are exceeding the company’s hurdle over a big area. However, as I noted, this play is 30 miles from north to south, and three well results that are shown on the cumulative production plot are 28 miles apart. SM indicated that the underlying geology is not homogeneous. We got a long way to go here before we can divide this [trend area] up into type curve areas and really give you a lot of definition about those various areas. The areas are different. And over time, we’ll get more — we’ll cut this acreage down and give you more details, but this is the best we can do at this point. In addition to the Frontier, SM is also testing other formations in the stack, including the Shannon, which is believed to be the next most promising target. Almost all SM’s acreage has additional either Shannon or Sussex potential. The Shannon, which SM believes has historically been under-stimulated, is particularly promising. The last well we did was a pretty encouraging [IP] number, given what we pumped… It was… not as exciting as the Frontier to us at this point, but I think there’s a lot of potential in the Shannon. When I look at them [the existing well results], I just say nobody has really gone out there and pumped as good a job as you can possibly pump… So I look at it as a significant upside to the Frontier in a lot of potential locations, but it’s certainly unproven at this point that it can be as economic as our Frontier program. I should note that the well cost in the Shannon is expected to be slightly lower than in the Frontier. In addition to the Frontier and Shannon, other zones are also known to be potentially productive and economic. For example, the Sussex is a shallower formation, which has been a significant vertical oil producer. In the past, QEP estimated EUR potential for short (5,000-foot) laterals in the 300-450 Mboe range. SM is stepping up its activity level to accelerate the delineation of its PRB acreage. The company is currently running two operated rigs, and will be adding a third rig later in this quarter. The company is focused on improving drilling performance and refining completion designs, and adding a third rig should help SM accelerate that process. SM now expects to complete 11 operated wells in the Powder River Basin in 2014, up from the 8 the company had planned for in its original budget. Several of these wells target the Shannon. The slide below shows new well locations to be drilled in 2014 (please note, three locations have been added to the 2014 program that are not shown on the map). It is still premature to say that SM’s entire acreage position “works” for the Frontier – further delineation is obviously required. But the wells drilled so far by SM and offset operators already have shown commercial success and, importantly, have been fairly consistent, which is encouraging. If SM’s 2014 delineation program proves successful, it may create impetus for other operators to step up drilling effort in the PRB. SM’s program may create a positive read-across to other stocks. Bill Barrett (BBG) is one that immediately comes to mind. Bill Barrett owns significant interest in the PRB (68,000 net acres and ~1,330 boe/d of production), and is currently marketing the asset. Disclaimer: Opinions expressed herein by the author are not an investment recommendation and are not meant to be relied upon in investment decisions. The author is not acting in an investment advisor capacity. This is not an investment research report. The author’s opinions expressed herein address only select aspects of potential investment in securities of the companies mentioned and cannot be a substitute for comprehensive investment analysis. Any analysis presented herein is illustrative in nature, limited in scope, based on an incomplete set of information, and has limitations to its accuracy. The author recommends that potential and existing investors conduct thorough investment research of their own, including detailed review of the companies’ SEC filings, and consult a qualified investment advisor. The information upon which this material is based was obtained from sources believed to be reliable, but has not been independently verified. Therefore, the author cannot guarantee its accuracy. Any opinions or estimates constitute the author’s best judgment as of the date of publication, and are subject to change without notice. research & experts on 3,000+ small & mid-cap stocks in the PRO library.